I received a frantic call from a company who could not figure out why one of their products was not working properly. The circuit was a fairly simple motor controller which pulsed a motor in either a clockwise or a counterclockwise direction. The motor movement opened and closed a small fluid valve, which was part of complex industrial system. The control board was housed in a water tight plastic box, which in turn was housed inside a metal enclosure. The company said the symptoms were fairly consistent. Often the valves did not fully open or close. But, every time they tested the suspect circuit boards at their facility, they worked perfectly. I asked them to send me a few boards to test, a couple motor/valve assemblies and any supporting documentation. A shortened motor pulse time would explain why the units were not fully closing or opening the valve. I suspected there was a temperature issue. The metal housing might protect the electronics from rain and snow but did nothing about the large temperature swings which can occur in an outside environment. I looked at the circuit schematic. As shown below, the company used a pretty simple one-shot circuit. The circuit used a flip/flop and an op Amp, to produce an accurate 1 second pulse. The 1M resistor and the 1uF capacitor formed the (RC) timing components, which defined the duration of the motor operation. A short pulse from their main computer at the input of the circuit fired the one shot. The pulse was supposed to be long enough to fully open or close the valve but not so long that the motor was being driven in a stalled state for very long. At first glance, all seemed to be in order. I fired up one of the circuit boards and connected one of their motor/valve assemblies. At my test bench, the motor and valve seemed to work perfectly and the pulse measured close to 1 second. Using a hair dryer and some Freon freeze spray, I was able to heat and cool the whole board. Bingo! In both hot and cold conditions, the valve did not fully open or close. One or more of the components on the board were quite temperature sensitive. Looking at the schematic, the 1uF capacitor was most likely the part which was temperature sensitive. Resistors are fairly stable and the op Amp should be rock solid. With the freeze spray and a soldering iron, I could prove that the capacitor was indeed the root cause for the shortened power pulse to the motor. Now, how do I fix the problem? I shifted my focus to the assembly material list. 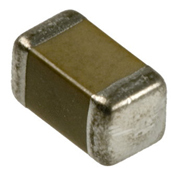 The part called out was a 1uF 16v 0805 surface mounted ceramic capacitor with a 5% tolerance. But, they didn’t specify the kind of ceramic capacitor. When I looked up the specified part number, I noticed that the part was indeed a 1uF capacitor but had a Y5V dielectric. 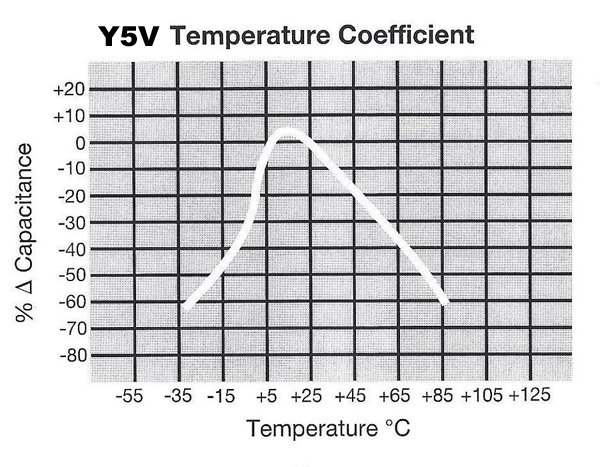 Digging a little deeper, I saw that the Y5V dielectric had a terrible temperature coefficient as shown below. The inverted V shape of the curve meant that the capacitance would decrease when the part was either hot or cold. This now all made sense. At room temperature, the whole circuit worked perfectly. But, when the assembly was quite cold or hot, the motor pulse would be considerably shorter. At the extreme temperature ranges, the pulse could be only half as long as it should be. The fix was to specify a more stable capacitor. 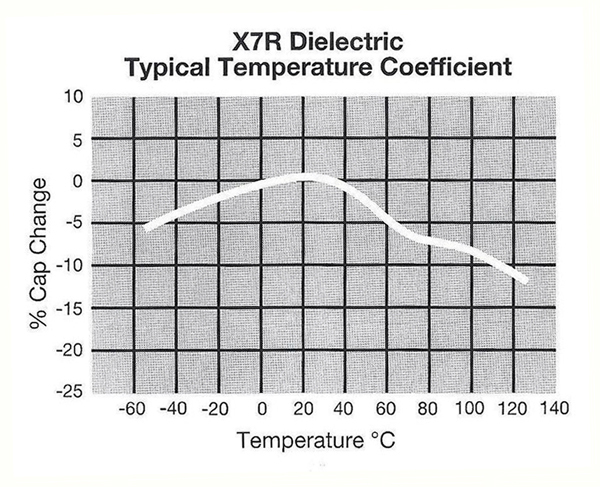 As shown below, a similar part, using a X7R dielectric would only change by about 7% when hot. So, the solution was to specify a X7R part. Those boards containing the wrong capacitor could be easily fixed by replacing the timing capacitor. Once all the changes were made, the company reported to me that they had no more problems.